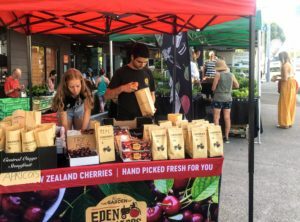 Come and hang out at our small, perfectly-formed, neighbourhood market on Sunday morning. Chat with some locals, get a drink and something yummy to eat. Locals love to talk to the wonderful people who grow and make the nutritious and delicious foods. They stock up on Fresh Gardens’ certified organic leafy greens, and George’s wide range of fresh, locally-grown vegetables, and some fruit – most of it is spray-free. Berries are a great treat at the moment – Mamaku Blue Blueberry Experience Blueberries have arrived, Eden Orchards cherries are even more delicious than at Christmas, and of course, George has strawberries (including frozen berries that make great smoothies). You will also find: Salmon Man, Il Casaro cheeses, Zeki’s Turkish Bakehouse & Cafe breads and snacks, Narbey Olive Oil, Not Milk nut milks and vegan chocolate mousse slice, Something Big is Brewing NZ Kombucha, Red Hot Kiwi Company Salsa, Paradise Lost flowers, Jersey Girl Organics A2 Milk, The Coffee Store and Bacon Brother’s Food Truck. … and while you are in the area, check out the Grey Lynn 2030 Car Boot Market across the road.